Emirates inaugurated its fifth US destination Thursday morning: Dallas/Fort Worth International Airport, the first scheduled nonstop flight between DFW and the Middle East. Emergency responders in Seattle recently took part in a massive rescue exercise at Seattle-Tacoma International Airport, simulating hostage situations, plane crashes and bombings. Here's an inside look. 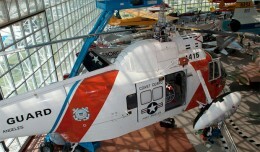 Nearly three decades after its final flight, a United States Coast Guard Sikorsky HH-52A Seaguard is once again airborne, hung from the rafters of the Museum of Flight.